Candlelight Processional is a dramatic reading of the birth of Jesus using a mass choir presenting traditional and contemporary Christmas songs accompanied by a full live orchestra. It is a very popular event. Dining packages include appetizer, entrée, dessert and non-alcoholic beverage at select Epcot full-service restaurants (or one full buffet where applicable), and guaranteed seating for the Candlelight Processional. Dining packages do not include park admission. My touring recommendation is to either book a dining package or to attend the 3rd show of the night. Which narrator are you most excited to see? Who will you miss from previous years? 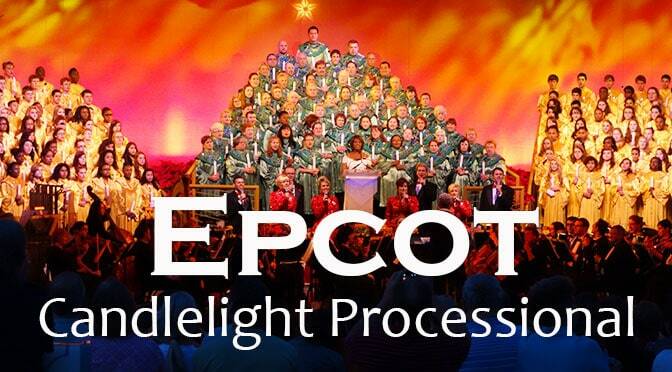 I am soooo excited to see Chandra Wilson narrate the Candlelight Processional! She is my favorite actress on Grey’s Anatomy! Do they ever let you get a narrator’s autograph after the last show?